Thinking about purchasing this just-released study on compensation practices but would like to first take a glimpse of what this study actually contains? No problem – QP Consulting has prepared one of its popular “executive summaries” highlighting key findings of this new report. No, it doesn’t reveal everything, but it certainly provides more than enough data, charts and graphs to help you make that final purchasing decision. For a limited time, the complete study (retail price $285) is available for only $233, an 18% Discount. Visit the bookstore to place your order. Offer expires May 16, 2016. 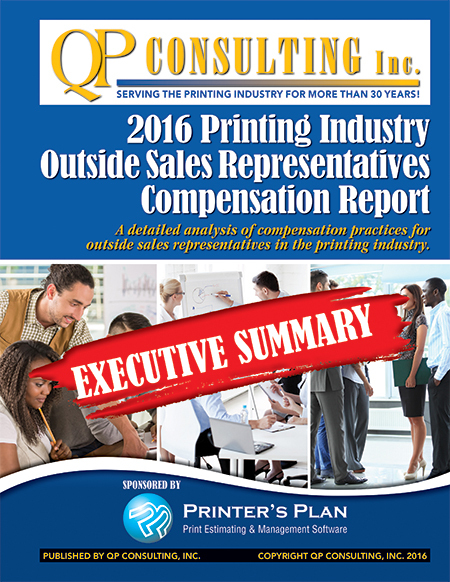 Sponsored by Printer’s Plan, this study is the ideal source for detailed information regarding compensation practices for outside sales representatives in the printing industry. Whether you employ two or three outside sales representatives or you’re just getting ready to hire your first, this study will point you in the right direction as to what you can expect in terms of sales performance and what you should be prepared to offer your new hire in return. To Download this “Executive Summary” click here or click on the adjoining cover artwork. Retail Price of Study is $285., however, as noted previously, this new report is available for a limited time for only $233, an 18% discount! Click here to go directly to our bookstore. As always, this study is offered on a 100% money-back guarantee if you are not totally satisfied with the overall value of this study.